Uveitis is defined as inflammation of the uveal tract, which is further subdivided into anterior and posterior components. 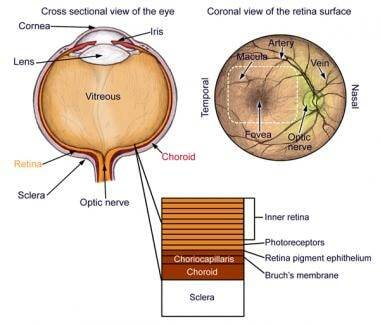 The anterior tract is composed of the iris and ciliary body, while the posterior tract includes choroid. Hence, uveitis is inflammation of any of these components and may also include other surrounding tissues such as sclera, retina, and optic nerve. Uveitis is often idiopathic but may be triggered by genetic, traumatic, immune, or infectious mechanisms. Symptoms of uveitis depend on several variables, the most important of which are type (ie, anterior, posterior, intermediate) and duration of symptoms (ie, acute chronic). Chronic anterior uveitis presents primarily as blurred vision and mild redness. Patients have little pain or photophobia except when having an acute episode. Patients with panuveitis may present with any or all of the above symptoms. Lids, lashes, and lacrimal ducts are normal. Conjunctival examination reveals 360° perilimbal injection, which increases in intensity as it approaches the limbus; this is the reverse of the pattern seen in conjunctivitis, in which the most severe inflammation occurs at a distance from the limbus. Pupillary examination may reveal direct photophobia when the light is directed into the affected eye, as well as consensual photophobia when light is directed into the uninvolved eye; consensual photophobia is typical of iritis, whereas photophobia due to more superficial causes, such as conjunctivitis, is direct but not consensual. This is the most important aspect of the examination. Examine the cornea via direct illumination with a broad beam at a 30°-40° angle between the viewing microscope and the light source. Keratitic precipitates (white blood cells) on the endothelium are a hallmark of iritis. Corneal edema and vitreous haze (large collection of inflammatory cells in the vitreous) may be observed. Intraocular pressure may be normal or slightly decreased in the acute phase owing to decreased aqueous humor production; however, pressure may become elevated as the inflammation subsides. Examine the anterior chamber using a vertically and horizontally short beam. Normally, the aqueous humor in the anterior chamber is optically clear. In uveitis, an increase in the protein content of the aqueous causes an effect upon examination known as flare, which is similar to that produced by a moving projector beam in a dark smoky room. White or red blood cells may be observed; layering of white blood cells in the anterior chamber is called hypopyon. Uveitis is defined as inflammation of the uveal tract, the anatomy of which includes the iris, ciliary body, and choroid. See the image below. The iris regulates the amount of light that enters the eye, the ciliary body produces aqueous humor and supports the lens, and the choroid provides oxygen and nourishment for the retina. Uveitis, particularly posterior uveitis, is a common cause of preventable blindness, so it is deemed a sight-threatening condition. Anterior uveitis is the form most likely to present to the emergency department. When the inflammation is limited to the iris, it is termed iritis. If the ciliary body is also involved, it is called iridocyclitis. The etiology of uveitis is often idiopathic,  However, genetic, traumatic, or infectious mechanisms are known to promote or trigger uveitis. Diseases that predispose a patient to uveitis and are likely to present to the emergency department include inflammatory bowel disease, rheumatoid arthritis, systemic lupus erythematosus (SLE), sarcoidosis, tuberculosis, syphilis, and AIDS. For infectious etiologies of uveitis, it is postulated that the immune reaction directed against foreign molecules or antigens may injure the uveal tract vessels and cells. When uveitis is found in association with autoimmune disorders, the mechanism may be a hypersensitivity reaction involving immune complex deposition within the uveal tract. Seronegative arthropathies include nonspecific, ankylosing spondylitis, Reiter syndrome, psoriatic arthropathy, and inflammatory bowel disease. Posterior uveitis was next most common, with 19.4% of cases, the most common etiologies being Toxoplasma (24.6%), idiopathic (13.3%), cytomegalovirus (CMV) (11.6%), SLE (7.9%), and sarcoidosis (7.5%). Most people who develop uveitis are aged 20-50 years. No deaths due to iritis or uveitis have been reported. Generally, the prognosis for iritis and uveitis is good with appropriate treatment. For patient education resources, see the Eye and Vision Center. Also, see the patient education articles Anatomy of the Eye and Iritis.